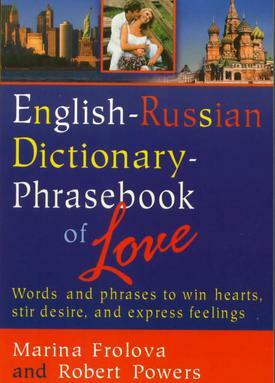 This 800-page English-Russian dictionary and phrasebook, the only one of its kind, is exclusively devoted to love, romance, and relationships. It endows the user (male or female) with the ability to express beautiful and exciting thoughts in Russian that will surprise, delight and enrapture the person of their heart. Desired expressions can be found under the key word(s) contained in them. Russian words are accented, and footers on each page provide useful tips about Russian and references to appendices. The 21 appendices feature the Russian alphabet & pronunciation, Russian grammar, conjugated verbs, time zones of cities, place nouns with case endings, metric measurements, adult heights and weights, customs, holidays, laws, marriage procedures, mail, introduction services, and more.